NIELIT CCC Online Course: CCC is a certificate program that gives an opportunity to the common man to gain knowledge about computer and information technology. CCC certification is an innovative course that aims to spread digital literacy in the country. NIELIT CCC Course online is available through out the year. National Institute of Electronics & Information Technology (NIELIT) is an autonomous society that works under the Govt. of India to carry out Human resource development activities in the field of Information, Electronics and Communication Technology (IECT). NIELIT was formed in 1994 and was formerly known as DOEACC Society. It is administered by the Ministry of Electronics and Information Technology of the Government of India. It offers various programs related to IECT at different levels and CCC certificate course is one the digital literacy programs offered by this organization. Course on Computer Concepts (CCC) certificate is a computer literacy program and was recommended by the National Task Force on Information Technology and Software Development. CCC is a course designed to impart basic IT literacy program to the common man. CCC is a program that NIELIT offers under its Digital Literacy Program. Through this course, a common man accesses the computer and can enjoy the world of information technology. The total duration of CCC course is 80 hours that include 25 hours of Theory, 5 hours of Tutorials and 50 hours of Practicals. It could be 2 weeks intensive courses ideally. It includes total of 8 chapters viz. 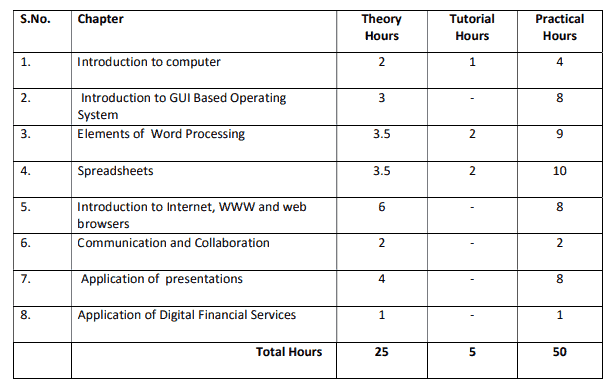 Introduction to computer, Introduction to GUI Based Operating System, Elements of Word Processing, Spreadsheets, Introduction to Internet, WWW and web browsers, Communication and Collaboration, Applications of Presentation and Application of Digital Financial Services. Like other exams, there are no minimum or maximum requirement for filling the CCC application form. Candidates can submit the application irrespective of age or educational qualification. 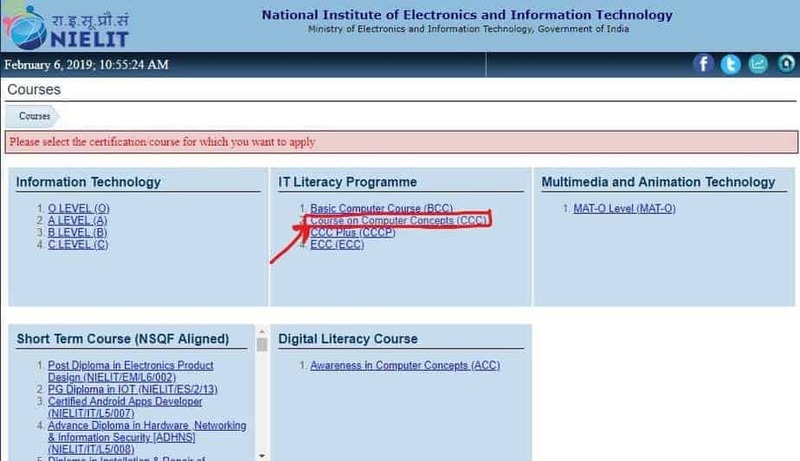 Candidates who are sponsored by the NIELIT approved institutes- Such candidates are permitted to join the course irrespective of any educational qualification. Applicants who are sponsored by the Government recognized Colleges/ Schools and have obtained and Unique identity number from NIELIT for joining CCC program- such candidates can also conduct CCC irrespective of any qualification. Direct Candidates (without being sponsored by a Govt. recognized college/school or undergoing the accredited program/course)- are eligible irrespective of educational qualification. 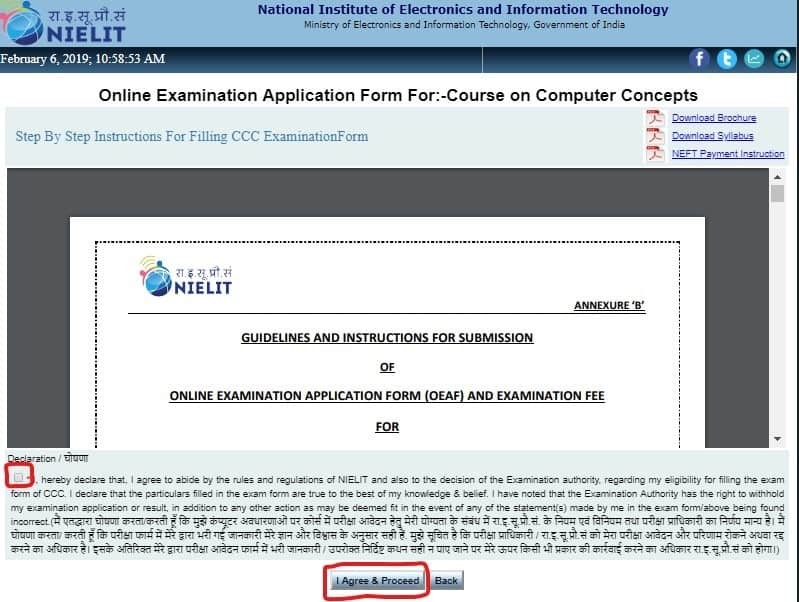 CCC Online Examination Application Forms (OEAF) are made available on the NIELIT portal. Candidates must be ready with all the essentials before filling the application form. Applicant needs to have a personal mobile No. so that he/she can validate the application form and receive all the intimations from NIELIT in future. Applicants must have a personal Email ID required for validation and future correspondences. Email Id is required to be active during the whole certificate program. A scanned passport sized photograph, signature and Left Thumb Impression in the prescribed format. Applicants can take help from the procedure shared below to fill CCC application form. Visit the official NIELIT student portal. On the homepage of the portal, click the “Apply Online” link. 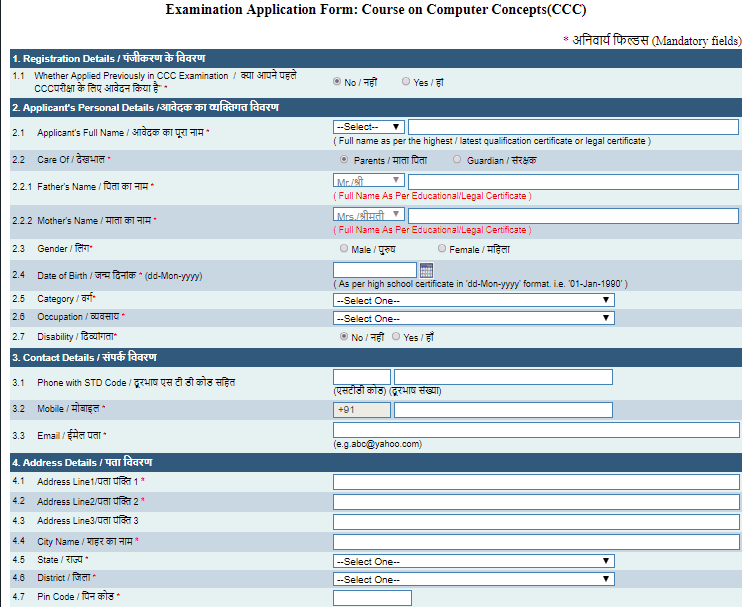 In this page, applicants have to select the CCC course among the various courses. 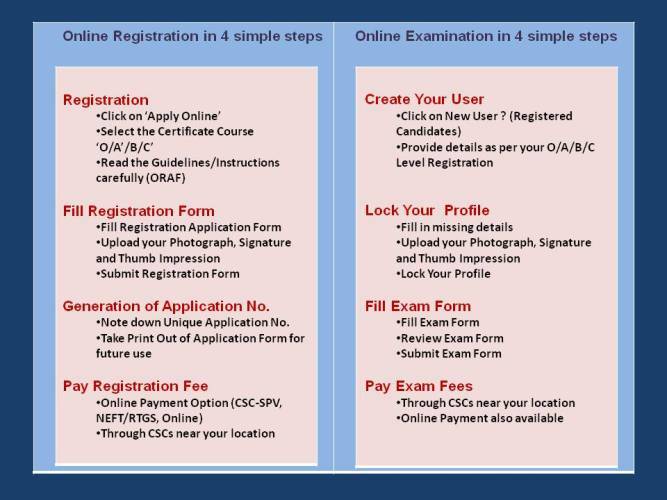 Now candidates have to read the read the instructions and guidelines of Online Examination Applications Form (OEAF) and fee carefully. After reading they have to mark the required fields in the declaration and have to proceed further. Application forms will appear on the screen. Candidates have to fill the registration details, personal, contact, address, qualification, examination details and have to upload the required documents in the identification details section. Once the details are filled they have to enter the security number and have to click on the “Submit” button after reading the declaration. After submission, applicants will get a preview of filled in examination form. In case the candidate wants to make changes in any entry they can do so by clicking on “Back” button. After previewing applicants have to click on “Final Submit”. They will receive a confirmation mail and SMS. Lastly, the candidate has to make payment of a fee. They have to select a payment service from the three options and have to make the payment. The CCC examination and certification fee for all the candidates is Rs.500 plus GST (as applicable). Application fee can be paid through Online (credit/debit/net banking) mode or CSC SPV or NEFT. Candidates have to download admit card before the commencement of exam. Admit card will issue only through the online mode and only to the candidates who have registered successfully. Click on “download admit card” link. Select course i.e. CCC under the head IT Literacy program. Enter the application No. and other required credentials. Admit card appear, they can download and take a printout of it. Along with the admit card, candidates are required to carry any of the following photo Identity proofs to the examination center- Aadhar card/ PAN card/ Voter Id/ passport/ driving license/ Student ID card/ id card issue from govt./ bank passbook/ id card issued form gazetted officer/Tehsil or credit card. Direct link to check result – To be displayed here. A candidate who has appeared in the CCC exam can obtain their CCC certificate only through mode. From 2014 onwards candidates are issued only digitally signed e-certificates. Candidates have to fill all the necessary details and click on submit. Now they have to verify code via SMS or email. They have to verify the digital signature. Download the certificate using Adobe Reader or Internet Explorer. Keep the PDF of e-certificate safe for future purpose. No fee is charged from the candidates other than the examination fee. No request for correction in examination form/certificate is entertained by NIELIT from 5th September 2013 onwards. Only those candidates can apply for correction who have filled offline application forms before the launch of the online portal. Candidates are not required to submit the hard copy of application form at NIELIT office. What is CCC certificate full form? Is there any minimum age limit for application? No, there is not any minimum or maximum age limit for this program. No, documents are required to be submitted with application form at any place. Is there any need to submit the hard copy of application form? No, there is no need to submit the application form or any other document at NIELIT Centres or any other place. How can I get the confirmation that my application form is under processing or has been processed? Can I submit more than one examination form in a single exam cycle? No, multiple application forms from a single candidate in a single exam are not allowed. 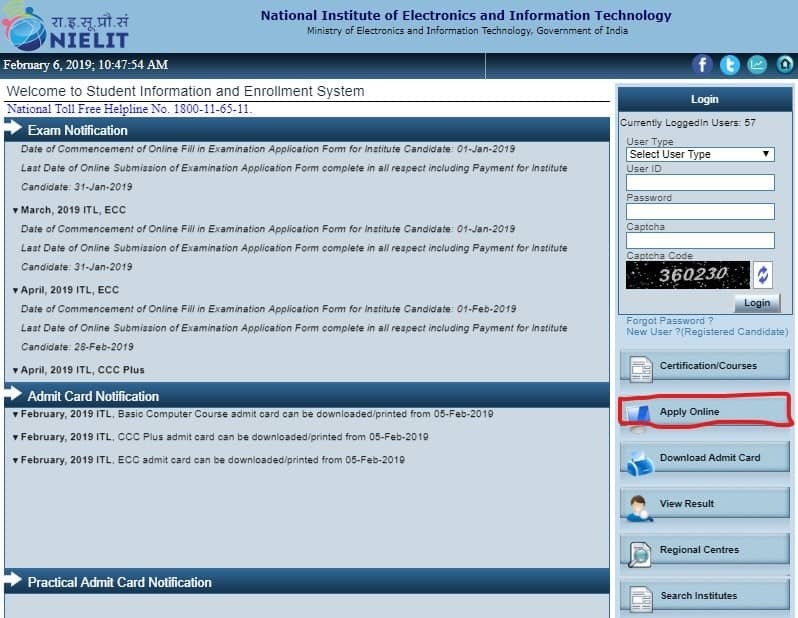 What if there is any mistake in the admit card details? Admit card details are based on information furnished by the candidates in the application form. Hence, no request regarding correction will be entertained. In case I fail to qualify the exam, can I apply again? Is there any limit to fill application? Yes, you can apply again in another exam cycle and there is no limit for application. Who will issue the CCC certificate, if I pass the CCC exam? The CCC certificate will be issued by the NIELIT to the successful candidates. Is there any provision for submitting CCC examination certificate with the late fee and if yes then what is the late fee? What if CCC certificate is lost or mutilated? A duplicate certificate is issued. Complete guidelines are here- http://www.nielit.gov.in//sites/default/files/headquarter/Notification_for_Reissuance.pdf. Whom to contact in case of any query related to CCC examination and certification? Candidates can contact the regional office and if the query is not resolved at regional level then it can be escalated to NIELIT HQ New Delhi. Hope you have got the clear idea about the NIELIT CCC certification. If you have any more query in regard to CCC courses online you can ask us int he comment section below. Our expert team will help in answering the question. We try to minimize the wait time and respond ASAP. is CCC certificate from this institute Allowing by the Government offices of Gujarat? for allowing Government employee to Promotion benefits? Sir maine ccc ka form fees online pay kiya , sir paise deduct ho gye but form complete nhi hua, please help me. Just login again and download your application form and admit card. Age m fail ho gay or 2nd time chance milte h ky ??? 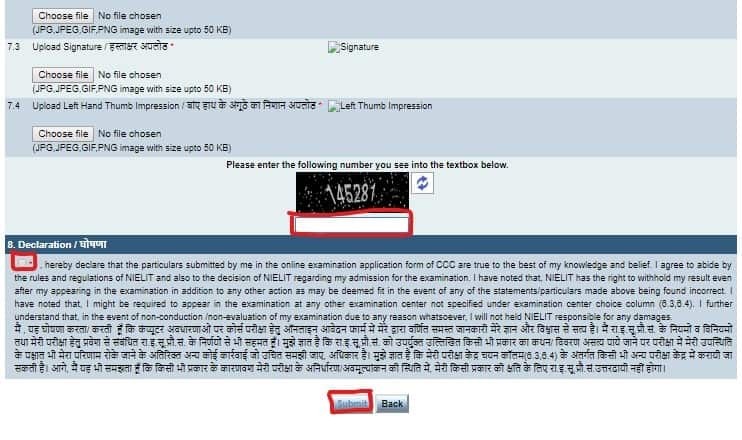 Sir, can I apply again CCC test just after writing same exam before result out?